Fits Outside Tile Dimensions: 6-1/2" x 6-1/2" to 8-1/2" x 8-1/2"
* Please Note: Not recommended for light colored masonry. They may stain surrounding areas over time. Critters and weather can cost you a small fortune in chimney repairs if you do not have a chimney cap to protect. Keep your chimney safe while also giving it a clean, classic look with the Gelco Chimney Cap. 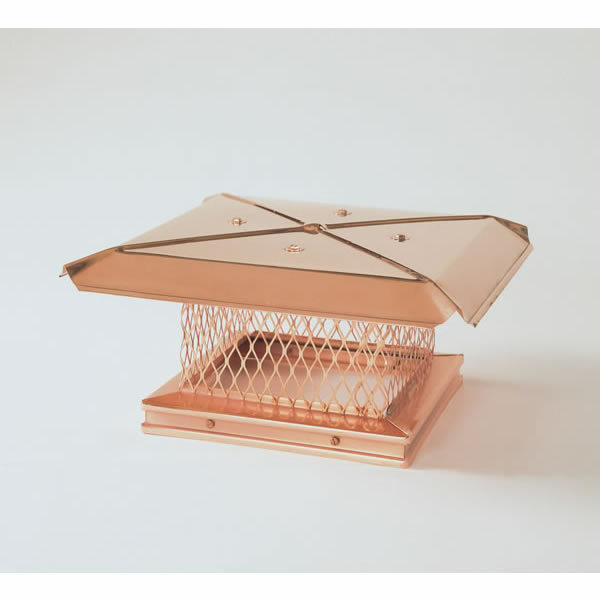 This chimney cap is entirely made of copper, which will give your roof a realistic appeal. This cap is designed to prevent animals such as birds and squirrels from calling your chimney "home" and also to keep rain and weather from damaging the inside of your chimney. For a reliable, attractive way to keep your chimney safe, look no further than the Gelco Chimney Cap. I really can't say enough about these attractive chimney caps. We purchased several of them and I only wished we had more fireplaces and more chimneys to cap! Your shipping was very fast and the items were packed very well. Installation was a very easy ordeal and literally completed in minutes. Everything I need for mounting the caps was included and was of good quality. I installed them about three months ago and they still look marvelous and withstand the strong winds that we experience in our area. We could have gone with a cheaper solution, but I am so glad we made this purchase. This is a great cap that looks fabulous! The installation was so easy and done in minutes. It is certainly worth what I paid, and I would be glad to recommend it. Our new cap for our chimney looks fantastic! Not only is it good looking, but it was a snap to install and we've just noticed that we will be able to take the top off for easy cleaning! Thanks for a great product. My gracious, I can't say enough about our new copper chimney caps!! We installed four of them at the same time we had our chimneys remodeled. It was one of the best home-improvement decisions we've ever made! It was a bit of a last minute decision,so we were so thankful you had them in stock. Shipping was very fast and in time for the mason to install them. Now all of the neighbors are jealous! I, too, am completely satisfied with my purchase of the copper chimney cap. It is made well, not too expensive, and delivered promptly. This cap seems to be a decent product. I am a very satisfied customer.I really like my new chimney cap. It was shipped out right away and installed in minutes.